We were in extremely high spirits as we drove home from Shenny this past Saturday – we were finished sanding! All told we spent 24 hours scraping and 16 hours sanding. There’s no doubt about the fact that it was hard work, but when we think about how much money we saved compared to hiring someone it was definitely worth it. The best part is that we shouldn’t ever have to do it again. If for some reason we do (like, twenty years down the road), we’ll pay someone given that we’ll be living in a country where the labor costs will be substantially lower than here in Connecticut. It got worse. But then it got better. The big weekend had finally arrived. Pegu Club was getting hauled out and we could get to work on her. We spent the previous weekend removing her sails, boom, lines, etc. in preparation for the haul out, but we also spent a lovely afternoon just hanging out in the cockpit on the water and getting comfortable on her. The weekend of August 15 and 16th was promising to be sunny and dry, and we were raring to go. 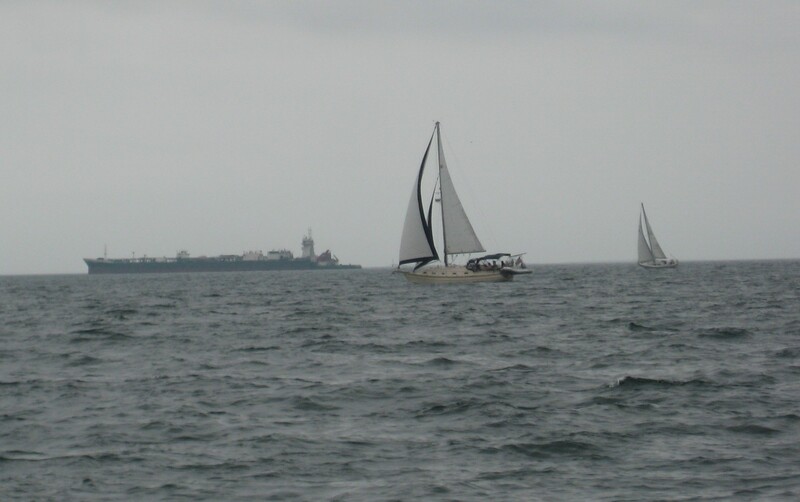 Labor Day Weekend Recap – a sail, preparing for vacation, and the Mega-Bed! Although the forecast wasn’t promising for the long weekend, we headed down to the boat anyway on Saturday after Jeff got out of work. The forecast is wrong quite often, and we lucked out in that this time it was wrong again. We had great weather during the day, and on Sunday night after Cruiser’s Midnight we had some thunderstorms and hard rain which cleared out by Monday morning. Jeff was greatly anticipating this weekend – the weekend of the mega-bed. I think his excitement matched mine for the Nature’s Head last weekend (which, by the way, is AMAZING!!!). We are members of the Bristol owners board (a Yahoo group), and a while back someone posted about how they had created a bed in the salon that they could break down each morning. 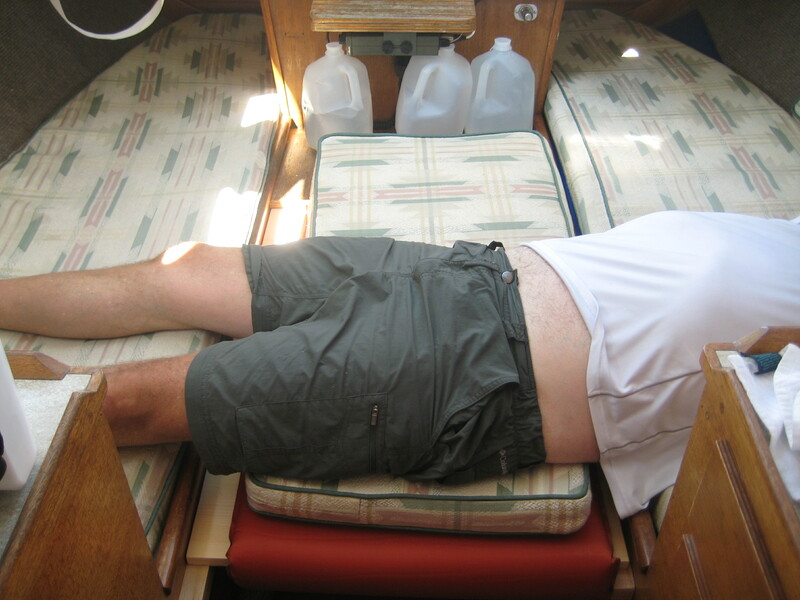 Jeff studied it, modified the design for our boat, and promptly dubbed it the mega-bed. 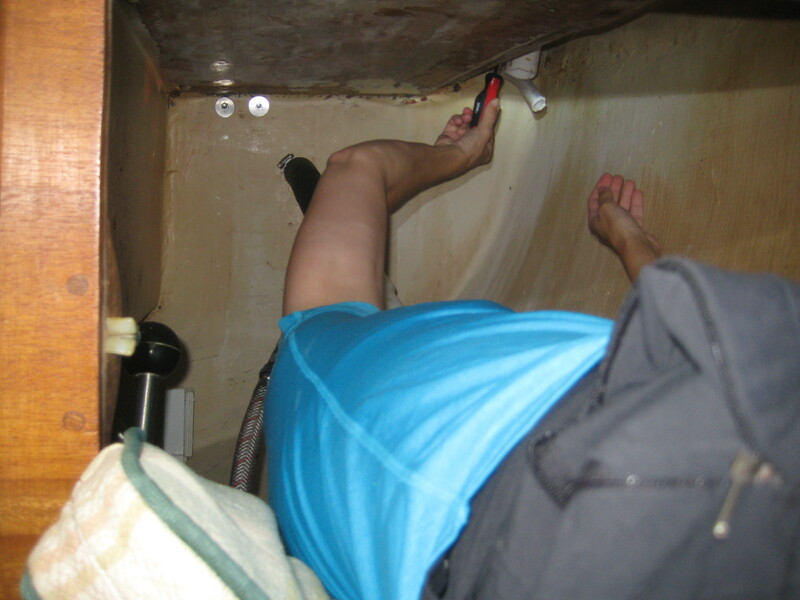 The mega-bed involved drilling two pieces of wood along either side of the “salon” (a word I use tongue-in-cheek given the diminutive size of our boat), then resting three pieces of wood in the middle. Cushions from the boat are placed on the wood, thermarest mattresses go on the cushions, and a memory foam mattress topper is next. All of this should create a level base, and then we can sleep next to each other with our heads on the port side and our feet starboard. Most importantly, Jeff can completely stretch out. The process went pretty smoothly, although we discovered that one piece of wood was a touch too wide. However, we then realized that our Yeti cooler was the appropriate height and we decided to use that instead. This has the added bonus of not having to move the cooler (which is really heavy) every night. We haven’t tried it out yet, but we’ll find out when we go back to the boat for vacation. Worst-case scenario we’ll just go back to the original sleeping arrangements. In addition to making the mega-bed (which didn’t take nearly as long as installing the Nature’s Head last weekend), we took care of a few miscellaneous items to get ready for vacation. Hooks were installed in the v-berth along with anti-skid so everything won’t go flying around if we encounter rolly seas like last year, we filled up the water tank, took stock of how much booze and drinking water we needed to bring, etc. The weekend wasn’t all about construction and preparation, however. On Sunday we went out for a fabulous sail around North Dumpling. 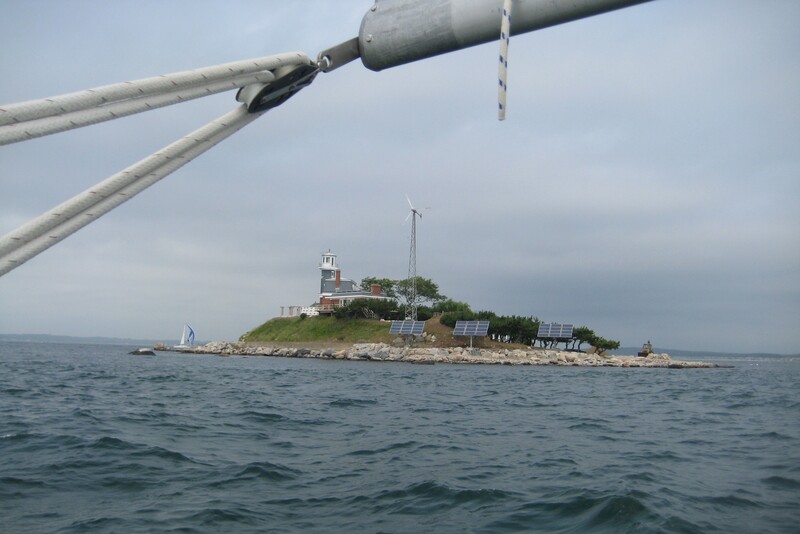 North Dumpling is a small island off of Fishers Island that is owned by Dean Kaman, the inventor of the Segway. According to Wikipedia, after Kaman was initially denied permission to build a wind turbine on the island, he joked that he was seceding from the United States, and later signed a non-aggression pact with his friend, then-President George H. W. Bush. Kamen refers to the island as the “Kingdom of North Dumpling”, and has established a constitution, flag, currency, national anthem, and a navy consisting of a single amphibious vehicle. The people of North Dumpling are called “Dumplonians”, and Kamen is said to refer to himself as “Lord Dumpling” or “Lord Dumpling II”. This is obviously all tongue-in-cheek of course, but I think it adds to its charm. 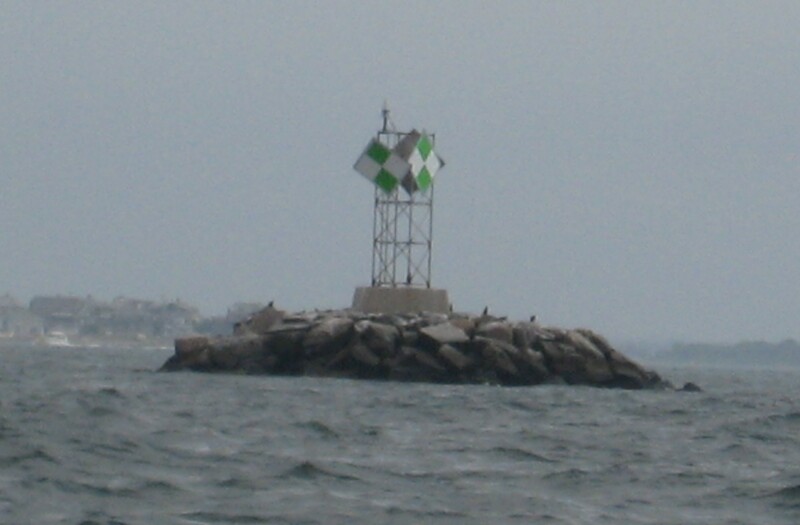 In addition to North Dumpling Lighthouse, the island features a replica of Stonehenge. North Dumpling has become one of our favorite “quick” sails. It’s funny because last year we were hesitant about sailing around it because the passage between North and South Dumpling seemed so narrow. When we finally did it towards the end of the season, we felt like we had accomplished something. This year it’s obvious that the passage isn’t that narrow, and we’ve sailed around it at least three times, including once with friends. It’s nice to look back and see how our confidence continues to improve. We don’t usually see freighters out where we are, so this was kind of cool. Seaflower Reef on the way to North Dumpling. All in all it was a fabulous weekend, and a great prelude to our VACATION (yay!) which begins on Saturday the 6th. Whoo-hoo! Our Nature’s Head composting toilet. A boat is a series of compromises – so the saying goes. In our case, the biggest compromise for me, by far, has been the head situation. 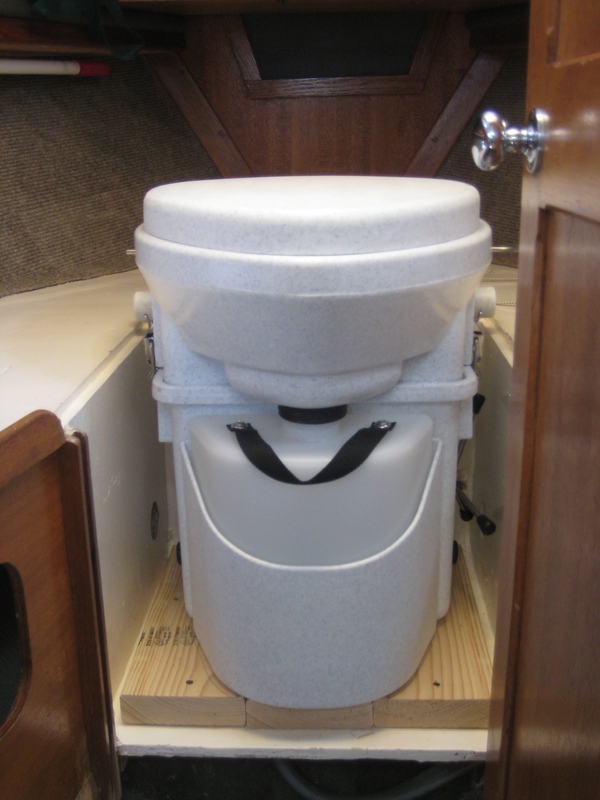 Before we bought this boat we already knew that we wanted to have a composting toilet. From all of our research, it seemed that with a traditional marine head there would inevitably be problems. Permeated hoses, overfilled holding tanks, leaks, odors – ack! There was no way we wanted to deal with any of that. Pegu Club came with a traditional marine head and while the setup was ingenious for a 24 foot boat, it was really intended more for day sailing. It wasn’t going to work for the way we were going to use her, so it had to go. Unfortunately, there wasn’t enough room in the v-berth if we wanted to sleep in it and have a composting head, so we settled for a portapotty. The portapotty was o.k. for the first season, but during our second season I became increasingly disenchanted with it. One Sunday morning on the boat we were sitting down below waiting out a rainstorm when we observed that we hadn’t used the v-berth for sleeping at all this season. Jeff fits better on the side berth as long as he opens up the hatch so his feet can go through, so the v-berth had become a defacto storage area. (Side note: he is working on a “megabed” design which, if it works, will be the subject of next week’s post.) Why not revisit the composting toilet idea? We called up the size specifications for the two main players in the field – Nature’s Head and Airhead – and took some measurements of the existing box where the portapotty was currently installed. It was going to be a tight fit, but it looked doable. We decided to make it an offseason project. Last week I was thinking about our upcoming two-week trip and how I REALLY didn’t want to deal with the portapotty for that amount of time. That’s how the UPS man ended up delivering a Nature’s Head composting toilet to our door on Friday. I was as excited as a kid on Christmas morning. The composting toilet works by having two separate bins – one for solids and one 2.2 gallon bin for liquids – with a pair of holes in the front directing liquids into the removable liquids bin and a trap door for solids. The solids bin has an agitator. Fill the bin up to the agitator with peat moss or coir and that’s it. Give the handle a few turns after you use it, and you’re done. There’s also a vent with a small computer-style fan that draws air out through a hose that is vented to the outside. Two people living aboard can use it for a month before emptying the solids bin. To do so you simply put a trash bag over the bin, empty it, and discard it. Some people will put it in a separate container to turn it into compost (hence, the composting toilet), but we definitely won’t be doing that. We’ve read literally hundreds of accounts on various websites, and with the exception of a couple of people, everyone loves it. No parts to break, no repairs, no added expense (beyond peat moss, which is nominal). There is absolutely no odor. For us it was a no-brainer. So Saturday evening we found ourselves at the boat, ready to install our Nature’s Head on Sunday and to MacGyver whatever was necessary to make it work. After a beautiful sunset and a yummy dinner of cappellini with shrimp and olive oil, and fresh green beans, it was off to bed for a busy Sunday. 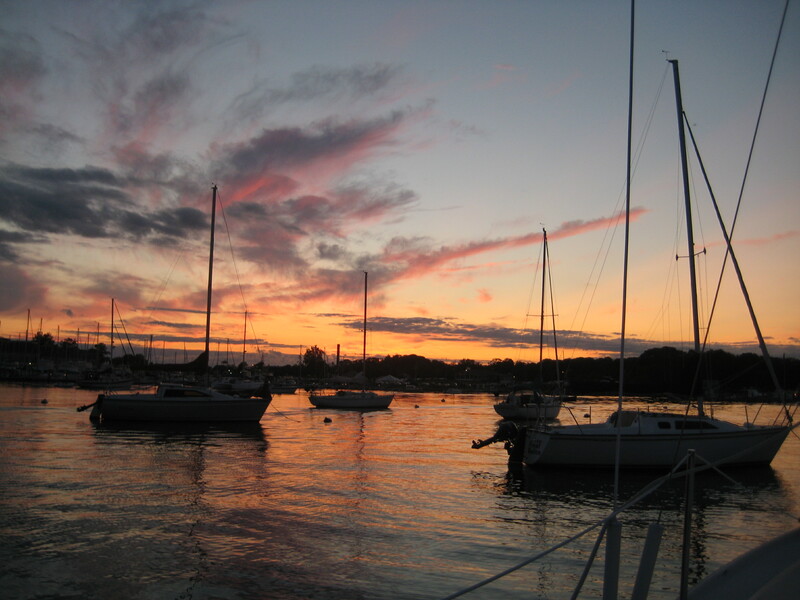 Sunset at Pine Island Marina. We got lucky in that Sunday was sunny with very little wind. The perfect day for a boat project. Overall the installation was very easy. 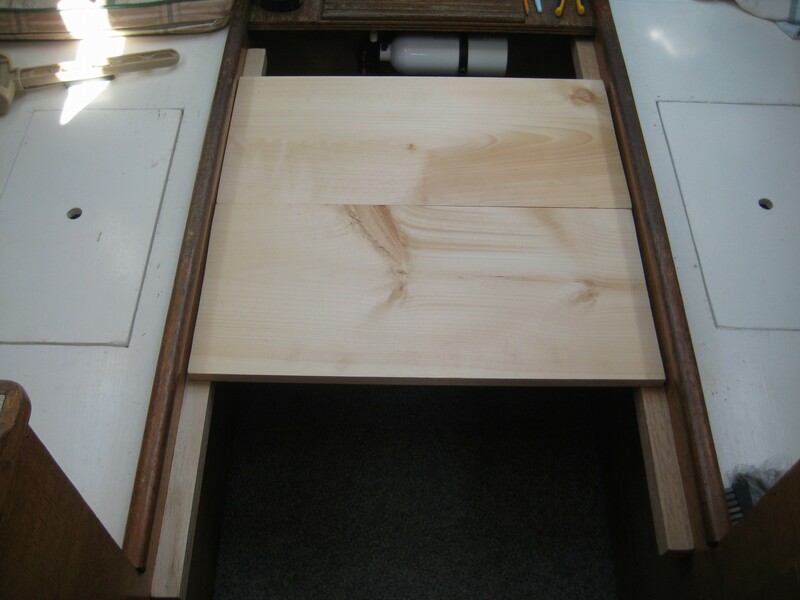 We had to build a base out of 2×4’s cut to size because the latches weren’t quite clearing the box in the v-berth. We got lucky, however, because even with the added height we had just enough clearance for Jeff’s head. We didn’t have to spend any time thinking about how we would run the ventilation hose, because we simply followed the route that the prior owner had taken with the hoses for the marine head. Of course just because the installation was easy doesn’t mean that we weren’t squeezing ourselves into small spaces or lying on the floor peering underneath areas while holding flashlights in our mouths. It’s a little easier for me to squeeze in here than Jeff, although he can also do it. Our only hiccup came with installing the wiring for the fan. We had already decided to remove the am/fm cassette radio and accompanying speakers, so we traced the wires and got rid of those. I’ve discovered I have a knack for tracing wires, although there was one horrifying moment where we thought we may have cut the wires for the running lights. We had planned to run the fan to the spot on the electrical panel where the radio was, but we didn’t have a long enough wire. So then we decided to wire it to the port LED light in the v-berth, but the fan wouldn’t work without the light turned on. We tried to run it above the light switch, but we still had the same problem. Ultimately we decided to remove the LED lightbulb and simply leave the fan wired in. We will likely buy longer wire and run it to the panel, but this works for now. Voila – the Nature’s Head was installed. This picture was before we hooked up the hose. The hose is connected to the port on the left. We drilled a small hole into the panel so we could thread the hose through it and underneath the “floor” of the box that the Nature’s Head is in, down through the bilge, into the area that I was working in above, and attached to the old pump-out which now has a mushroom vent on it instead. It was well after 7:00 p.m. by the time we were finished and it was time to pack up and head home, so although it’s prepped and ready to go we haven’t actually tried it out yet. That will be next weekend. But I have no doubt that this is going to be one of the best boat-related purchases that we’ve made so far. As for the portapotty? It’s going to stay in the basement until we buy the big boat. Then we’ll take the Nature’s Head out, install it in the big boat, and reinstall the portapotty for when we put the Bristol 24 up for sale.